Green Man handmade soap is a fresh and green oval with the scent of trees, herbs and hand painted with the green man of the forest. Buy this soap for lots of creamy bubbles and its gentleness on the skin. This is cold process soap at its best. Green Man Artisan Soap is scented with a blend of fresh greens, woods and herbs. Getting clean is more than just washing off dust and dirt. This handcrafted green herbal soap has a very fresh, wonderful green fragrance. Intermingling scents include various types of trees and herbs. Green Man soap with natural green clay will produce lots of bubbles whether you use your hands, a bath sponge, a body pouf or a loofah. I make my soaps with the cold process method and prefer not to gel. This keeps the colors lighter and I can use less scent. 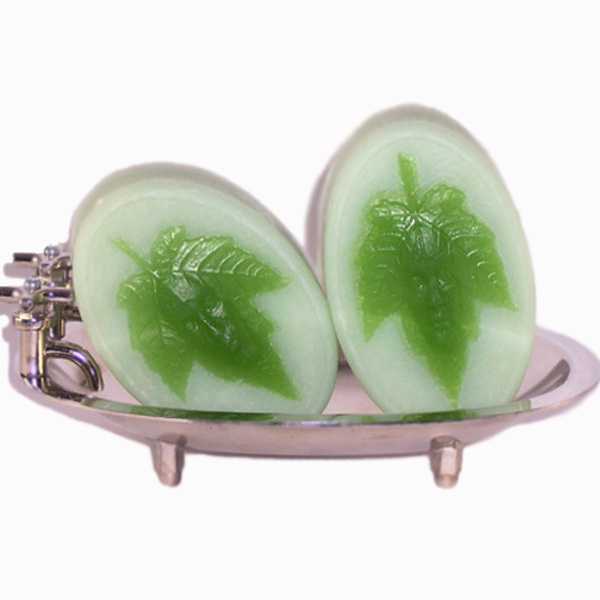 The soap is oval and each bar is hand painted with a green leaf, that has a image of a green man on it. Bring the fresh scent of outdoors to your home. You will love this fragrance every time you take a bath or a shower. Refresh and clean your skin with this beautiful handmade soap. Each soap batch is made by hand and cured here in Palm Springs. Each Green Man handmade soap is unique. Ingr: Olive oil, Coconut, Palm Kernel, Mango Butter, Castor oil, Soybean, Sodium Hydroxide, Beeswax, Fragrance, Sodium Lactate, Green Oxide, Green Clay from the Cosovo Mountain region in California, Fragrance.